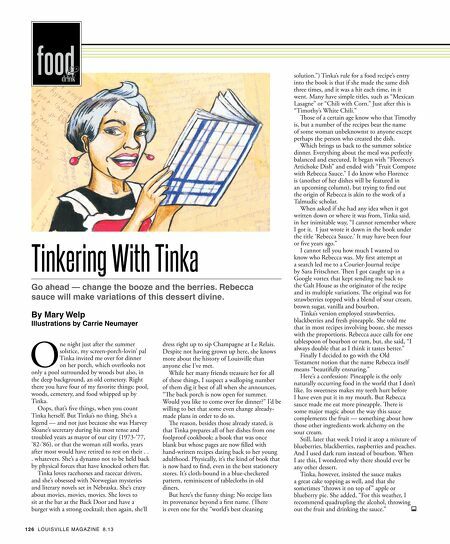 food & drink Tinkering With Tinka Go ahead — change the booze and the berries. Rebecca sauce will make variations of this dessert divine. By Mary Welp Illustrations by Carrie Neumayer O ne night just after the summer solstice, my screen-porch-lovin' pal Tinka invited me over for dinner on her porch, which overlooks not only a pool surrounded by woods but also, in the deep background, an old cemetery. Right there you have four of my favorite things: pool, woods, cemetery, and food whipped up by Tinka. Oops, that's fve things, when you count Tinka herself. But Tinka's no thing. She's a legend — and not just because she was Harvey Sloane's secretary during his most tense and troubled years as mayor of our city (1973-'77, '82-'86), or that the woman still works, years after most would have retired to rest on their . . . whatevers. She's a dynamo not to be held back by physical forces that have knocked others fat. Tinka loves racehorses and racecar drivers, and she's obsessed with Norwegian mysteries and literary novels set in Nebraska. She's crazy about movies, movies, movies. She loves to sit at the bar at the Back Door and have a burger with a strong cocktail; then again, she'll 12 6 LOUISVILLE MAGAZINE 8.13 dress right up to sip Champagne at Le Relais. Despite not having grown up here, she knows more about the history of Louisville than anyone else I've met. While her many friends treasure her for all of these things, I suspect a walloping number of them dig it best of all when she announces, "Te back porch is now open for summer. Would you like to come over for dinner?" I'd be willing to bet that some even change alreadymade plans in order to do so. Te reason, besides those already stated, is that Tinka prepares all of her dishes from one foolproof cookbook: a book that was once blank but whose pages are now flled with hand-written recipes dating back to her young adulthood. Physically, it's the kind of book that is now hard to fnd, even in the best stationery stores. It's cloth-bound in a blue-checkered pattern, reminiscent of tablecloths in old diners. But here's the funny thing: No recipe lists its provenance beyond a frst name. (Tere is even one for the "world's best cleaning solution.") Tinka's rule for a food recipe's entry into the book is that if she made the same dish three times, and it was a hit each time, in it went. Many have simple titles, such as "Mexican Lasagne" or "Chili with Corn." Just after this is "Timothy's White Chili." Tose of a certain age know who that Timothy is, but a number of the recipes bear the name of some woman unbeknownst to anyone except perhaps the person who created the dish. Which brings us back to the summer solstice dinner. Everything about the meal was perfectly balanced and executed. 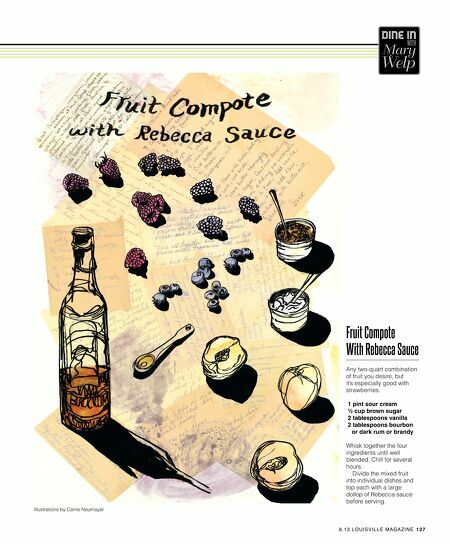 It began with "Florence's Artichoke Dish" and ended with "Fruit Compote with Rebecca Sauce." I do know who Florence is (another of her dishes will be featured in an upcoming column), but trying to fnd out the origin of Rebecca is akin to the work of a Talmudic scholar. When asked if she had any idea when it got written down or where it was from, Tinka said, in her inimitable way, "I cannot remember where I got it. I just wrote it down in the book under the title 'Rebecca Sauce.' It may have been four or fve years ago." I cannot tell you how much I wanted to know who Rebecca was. My frst attempt at a search led me to a Courier-Journal recipe by Sara Fritschner. Ten I got caught up in a Google vortex that kept sending me back to the Galt House as the originator of the recipe and its multiple variations. Te original was for strawberries topped with a blend of sour cream, brown sugar, vanilla and bourbon. Tinka's version employed strawberries, blackberries and fresh pineapple. She told me that in most recipes involving booze, she messes with the proportions. Rebecca auce calls for one tablespoon of bourbon or rum, but, she said, "I always double that as I think it tastes better." Finally I decided to go with the Old Testament notion that the name Rebecca itself means "beautifully ensnaring." Here's a confession: Pineapple is the only naturally occurring food in the world that I don't like. Its sweetness makes my teeth hurt before I have even put it in my mouth. But Rebecca sauce made me eat more pineapple. Tere is some major magic about the way this sauce complements the fruit — something about how those other ingredients work alchemy on the sour cream. Still, later that week I tried it atop a mixture of blueberries, blackberries, raspberries and peaches. And I used dark rum instead of bourbon. When I ate this, I wondered why there should ever be any other dessert. Tinka, however, insisted the sauce makes a great cake topping as well, and that she sometimes "throws it on top of " apple or blueberry pie. She added, "For this weather, I recommend quadrupling the alcohol, throwing out the fruit and drinking the sauce."